Isabella Broida is a freshman at Nordhoff High School and lived in constant pain. At age five Isabella was diag-nosed with Scoliosis, an excessive sideways curvature of the spine. 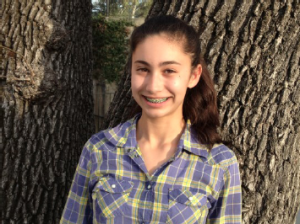 Since her diagnosis Isabella has had three different types of braces. She was only allowed to take the braces off to swim or shower. In the 8th grade her scoliosis had pro-gressed and she was fitted for a new brace, but it was so painful that Isabella refused to wear it. Isabella attended one of Robert‟s Yoga classes with her mother and shortly after began taking personal training sessions with Robert. She says that with the exercises that Robert has shown her she can actually feel her spine moving into more correct alignment. With Robert‟s guidance and encouragement and Isabella‟s determination and hard work the curvature of her spine has corrected into the normal range. She is now pain free, no longer needs to wear any sort of brace and is excited knowing that nothing can stop her now from following her dreams. Isabella has always been sur-rounded by role models caring for the sick or injured. Her father is an EMT, her grandmother is a nurse, her brother a firefighter and her mother is a mental health professional. Isabella‟s big dream is to become an ER Flight Nurse. After talking with this delightful, confident, intelligent and beautiful young woman, there is no doubt that she will be successful in what ever she chooses to do. But for right now she is for the first time just enjoying being a normal high school girl – dancing, hanging out with her family and friends, playing with her three dogs and her cat, all without pain. Her successes motivate Isabella to continue working out on her own as well as with her trainer, Robert. Congratulations on your accomplishments, Isabella. OVAC thanks you for sharing your inspiring story. My daughter, Isabella, was diagnosed with severe scoliosis and has been in a body brace on and off for nine years. With the help of Robert, a personal trainer and yoga guru, Isabellas’s scoliosis has been reduced by 8 degrees! We are so GRATEFUL to have found Robert who brings such knowledge, caring, and professionalism to his practice. Robert is absolutely the best, most careful, knowledgeable trainer imaginable. His vast knowledge of yoga and physiology never puts one at risk for injury. He is truly invested in good health and longevity with quality of life. To that end he will make diagrams, reprint relevant articles, check up on what progress one is making. Besides all of this he is funny and a gentle human being. Robert Evans is a wonder. I have had the great good fortune to work with him both as a trainer, and he is the MOST knowledgable trainer I have ever worked with, and also as a yoga teacher. Again, his knowledge, his compassion, and his humor make his classes unique, enjoyable , and challenging in the best ways possible. I cannot recommend him highly enough. Lucky anyone who chooses to work with him. Robert has been Emmett’s personal trainer for over five years now. During that time Emmett was bed ridden a year in 2010/2011 with a spinal infection which led to severe arthritis in his back. He also developed limited motion in one shoulder and weak upper body strength and very weak leg strength. After working with Robert for just 3 months Emmett has retired his wheel chair and can now walk longer distances mostly without a walker. His range of motion in his shoulders is back and leg and upper body strength is greatly improved. Just as importantly with all the physical exercise Emmetts depression has lifted and his mind is sharper. He is laughing and joking again. He no longer complains of back pain and his legs and ankles are not retaining fluid anymore. This is a major improvement for my dad Emmett. You see Emmett is going to be 85 years young next month. Carry on Robert! We could not have done it without you. Club members Rainey Barton, Nancy Welter, Carol Paquette, along with Nancy’s sister, Susie Welter pictured here. Seen here dipping our back tires in the Mississippi River we just finished thank you biking 403 miles in the summers Ragbrai across the state of Iowa. Ragbrai stands for Register’s Annual Great Bicycle Ride Across Iowa. The four of us biked 7 days, with 10,000 others, averaging anywhere from 54-84 miles a day from the Missouri River to the Mississippi River. Stopping in hosts towns along the way camping, staying with Welter relatives and hotels. 3 weeks before the ride I begun working with Robert Evans on his scoliosis program at the gym. After reading about his successes working with a former student who also had scoliosis, I decided to give Roberts program a try. Having always tolerated my back pain, poor posture and never being able to do a sit up, I was willing to try anything. 2 weeks before the ride Nancy and I did a 40 mile training ride. I mentioned to Robert my back hurt some. He encouraged me to bring my bike to the gym so he could make any adjustments . He adjusted the handlebars, gave me a series of back stretches and at that time we were half way through his program working the back and core focusing on my scoliosis. I completed the ride with absolutely no back pain. The handlebar adjustment relieved the pressure on my back. The stretches were done both before and after the ride each day. The building of the core and back was happening during the workout sessions and I could feel myself getting stronger, having better posture and less back pain. I just did a set of 15 sit ups!!!!!! Robert always pays attention to club members when he sees them and noticed that I was struggling with going up and down stairs after playing tennis. I have bad knees from skiing and other sports and have developed arthritis in both of my knees, I have had one ACL replaced and Meniscus cleaned in the right knee. Robert convinced me that he would be able to help with my movement and strengthen my legs to help my knees. In two weeks there was an amazing improvement – even Robert was shocked at how quickly my knees responded to the strengthening exercises and routines he gave me to work on. I am more than thrilled about the improvement – I realize that I have to help my body if I wish to continue to play tennis and be active! Robert has been great and very inspirational!